What a powerful exchange this was between Jesus and the two criminals who were crucified with Him on His right and on His left. Our Blessed Mother stood in silence, listening to them converse. There is no doubt that as she heard the words of her Son, her heart leaped for joy. Which criminal represents you more accurately? One criminal is filled with self-righteousness stemming from pride. The other is filled with sorrow stemming from humility. Both are guilty but only one is forgiven. They both acknowledge Jesus as the Messiah but only one takes ownership of his sin. The first criminal speaks, “Save yourself and us.” What he fails to see is that Jesus is in the very process of doing just that. By suffering and dying He is destroying sin and winning salvation for all who humbly seek His mercy. His death is the gateway to Paradise. The first criminal fails to see this. Instead, he seeks immediate earthly “salvation” by challenging Jesus to save him from death on the cross. But the other criminal identifies the glorious mission of our Lord. He acknowledges that his own death is an act of justice due to his sins. “We have been condemned justly,” he professes. But the “good thief” does not stop there. He humbly asks Jesus to remember him as he enters into His Kingdom. Jesus assents and offers this criminal the grace won by Jesus’ own imminent death and promises him Paradise. As our Blessed Mother looked on, her heart was filled with both joy and sorrow. Her sorrow was on account of the first criminal who failed to humbly acknowledge his guilt. Her joy was on account of the other criminal who humbled himself before her Son and received eternal life. 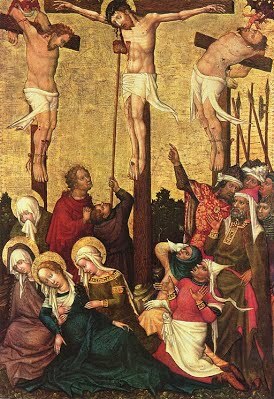 Mother Mary saw, as her Son hung on the Cross, the promise of Paradise being petitioned for and then granted. The joy she felt by witnessing the salvation of this criminal consoled the sorrow she felt at her Son’s brutal treatment. We are all called to bring joy to the heart of our Blessed Mother. We do so when we humbly admit that we, too, are “criminals” in the sense that we are sinners. The punishment we deserve is death. But if we humbly admit this truth, we must also find the courage to beg our Lord for His mercy and to welcome us into Paradise. Reflect, today, upon the words of this good thief. “Jesus, remember me when you come into your kingdom.” Our Lord died in order to pry open the gates of Paradise first shut by Adam’s sin. Reflect, also, upon the joy you bring to our Blessed Mother every time you humble yourself before the grace won by the Cross of her Son. Dearest Mother, as you stood before your Son and heard Him promise salvation to the thief who repented, your heart leaped with pure joy. I pray that I may also bring joy to your heart as you see the grace of the Cross of your Son pour down upon me. My dear Mother, pray for me that I may also take joy in the repentance of all sinners. Too often I find myself judgmental and slow to forgive. May my heart imitate your pure love and may I find joy in the conversion of all who turn to your Son. My forgiving Savior, I am condemned justly for my sins and deserve death. Forgive me and have mercy on me, dear Lord. I repent of my sins and ask You for the grace to be remembered by You in Your glorious Kingdom.